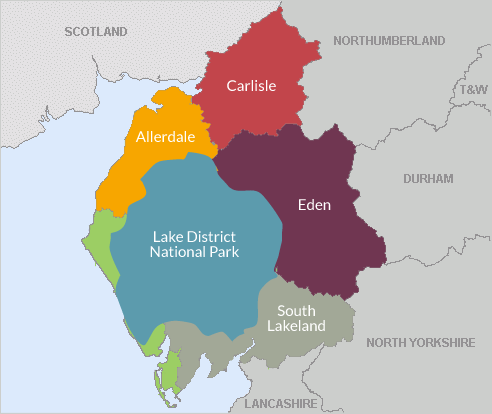 Cumbria Tourism, along with a number of partners including most of the district councils, and the Lake District National Park Authority, commission Global Tourism Solutions Ltd to estimate the economic impact of tourism in Cumbria. This is achieved through use of a model called STEAM (Scarborough Tourism Economic Activity Monitor). Through STEAM the county has a continuous tourism economic impact dataset from 2000 to 2016. STEAM uses locally-derived data from a variety of sources including tourist information centres, visitor attractions and events, accommodation bedstocks and occupancy rates. Data is analysed to produce estimates of the number of visitors, visitor days, employment supported by tourism, and revenue generated. In 2017 Cumbria and the Lake District received over 47 million visitors, made up of 40.7 million day trippers and 6.6 million overnight visitors. Between them, day and staying visitors combined to produce 62.7m tourist days. These visitors brought in £2.9 billion to the region’s economy and provided employment for 37,796 full time equivalent (FTE) posts. As many tourism jobs are actually part time, or seasonal, the total number of people in tourism jobs is estimated at 64,992, around 20% of the county’s total employment. Between 2016 and 2017, there was an increase of 5.5% in tourist days, 4.8% in tourist numbers, and 6.4% in tourism revenue. This builds on increases in 2013, 2014 and 2015. In 2017 the county welcomed an extra 2.2m visitors, and generated an additional £175m, taking total tourism revenue to £2.9bn. Staying visitors grew at a faster rate than day visitors. Staying visitors increased by 6.2%, equivalent to an extra 222,000 visitors, and day visitors by 5% – almost 2m additional day trip visits. Much of the staying visitor growth was due to those choosing non-serviced accommodation (self-catering, caravan and camping etc) – non-serviced accommodation visitor numbers grew by 6.6% and visitor days by 9%. Looking at sectors of expenditure, significant increases were seen in most areas. Revenue from shopping grew the most, by 9.3%, followed by food and drink (8.4%) and recreational activities (8.2%). Accommodation revenues were similar to 2016 levels. A more detailed report is available with information by area, visitor type, sector, and seasonality CLICK HERE.